Judge Moore has it backwards. It is the statues themselves that cause irreparable harm to the people of this city. The Lee and Jackson statues were erected in our two parks at the height of Jim Crow segregation and during one of many rises of white supremacy in this country. The statues were put there with the purpose of marking segregated space in Charlottesville and as an intimidating reminder of a racist hierarchy. The judge’s order on Tuesday ignores those harms to this community. The irreparable harm comes from the statues’ presence themselves — that constant, threatening reminder of the white supremacy hierarchy — which is why communities around the South, from Durham, to Baltimore, to Memphis, to New Orleans, to Dallas, are removing them. It is a new day in the South, where we will work in solidarity to defend our communities against white supremacy and #TakeEmAllDown. The statues now serve as invitations to violent white supremacists, as we saw so tragically in the white supremacist attacks of August 12. The judge is forcing the city to display these invitations to racial terrorism, despite the City Council’s unanimous decision to remove them. White supremacist Jason Kessler has already threatened to return on August 12 2018, even without a permit. As a city, we should not be required to invite more harm and danger into our community. We also remember that, at the same time one court is forcing us to maintain racist monuments, in another court the city is prosecuting three Black men for doing nothing more than showing up to defend Charlottesville from white supremacist violence. Just as we call for the removal of these statues to white supremacy, we call for the city to Drop The Charges against DeAndre Harris, Corey Long and Donald Blakney. 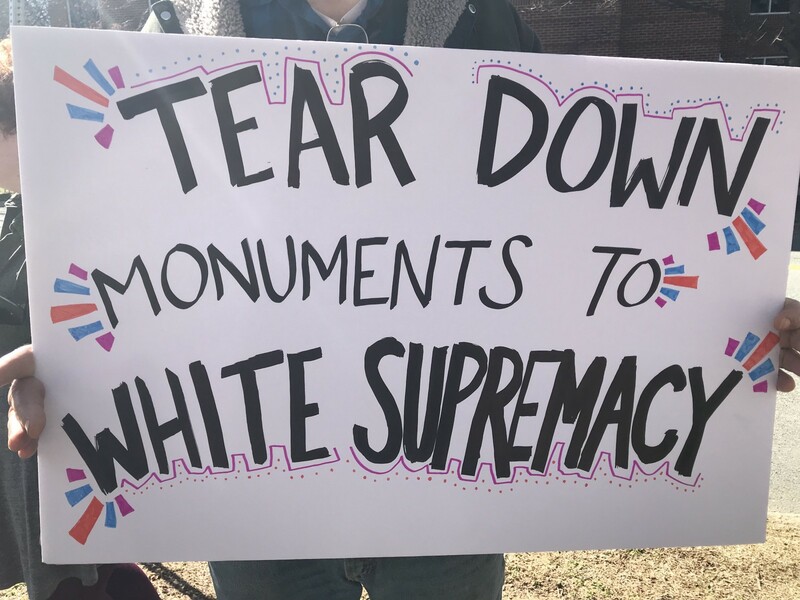 The city is being forced to display these monuments to white supremacy for the time being; it should not also reinforce the system of white supremacy by prosecuting these Black men for asserting their humanity in the face of white supremacist violence. Raise the shrouds. Drop the charges. Take down the statues. We fight for a day that doesn’t celebrate white supremacists. Tear down monuments to white supremacy. A sign at the #TakeEmAllDown rally. Solidarity Cville generates local, accessible, and community-centered media that amplify the marginalized voices of Charlottesville, VA.